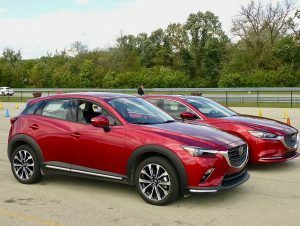 Two of the best inexpensive but high-tech compact SUVs are the Mazda CX-3, left, and the Hyundai Kona. The model year changeover is extra intriguing this year because of the numerous and impressive bits of technology that have made their way into the automotive world. 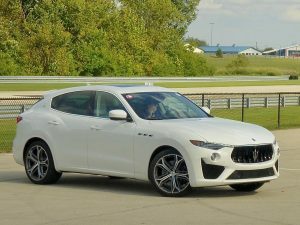 Here at Newcarpicks, we have whittled down the list of possible candidates for our Car of the Year down to the core, and the final decision will reflect the nation’s never-ending hunger for SUVs but will refuse to also recognize the seeming indifference to poor fuel economy that accompanies the quest for larer SUVs. No, two of our finalists are more similar than different, and the second of those just arrived for a week-long examinaton in the Great White North. It is the Mazda CX-3 for 2019, which changes subtly from 2018 as a transitional vehicle in Mazda’s always-enticing lineup. Gazing out at it in the early morning light at the Gilbert Compound on the North Shore of Lake Superior, I couldn’t take my eyes off it. It fairly glowed, like a large ruby, luring me to get out there and drive it. Somebody asked me what color it was, and I said I couldn’t remember the precise name, but it is a deep, lustrous red that goes right to your soul. Or at least my soul. Then I examined the sticker to see if I could find the color.. There it was: “Soul Red Crystal” it said. Not bad. Maybe the fact I suggested the color went right through me to my soul was a tip. That color came out two years ago as a different and exclusive red on the CX-5, the midsize member of Mazda’s three SUVs. 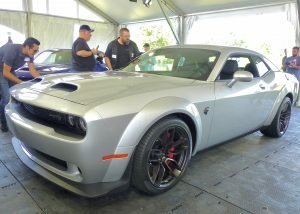 Last year it migrated to other models, where it will continue to be offered. It turns out that Soul Red Crystal is a $595 option. I mentioned that to my inquisitive friend with the added note that it was a very expensive color, and probably worth it! Swwms outrageous, perhaps, but I have never seen another color on any car, regardless of price, that affected me the same as Soul Red. 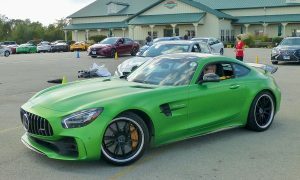 So how much is it worth to have a distinctive color that lifted you up every time you approached the vehicle. The CX-3 is a small SUV, too small by many contemporary standards, but the reason it is one of our finalists is that is loaded up with technology to match or surpass any other SUV, and it has some tricks that are beyond all the others. As one of our two award leaders coming around the final turn and heading down the homestretch, the CX-3 is opposed by the Hyundai Kona, the smallest SUV offering from that South Korean company, and it, too, comes loaded with technology that other low-priced SUVs can’t hope to challenge. That, too, looks good in its vast array of colors, but the red one stands out. Together, the two look like later Christmas tree ornaments. Ah, Christmas is drawing close, and those of us who have family members or close-enough friends deserving of a holiday gift — which includes about all of us! — might leave us baffled about what we could get them that would be really different. Unique, even. 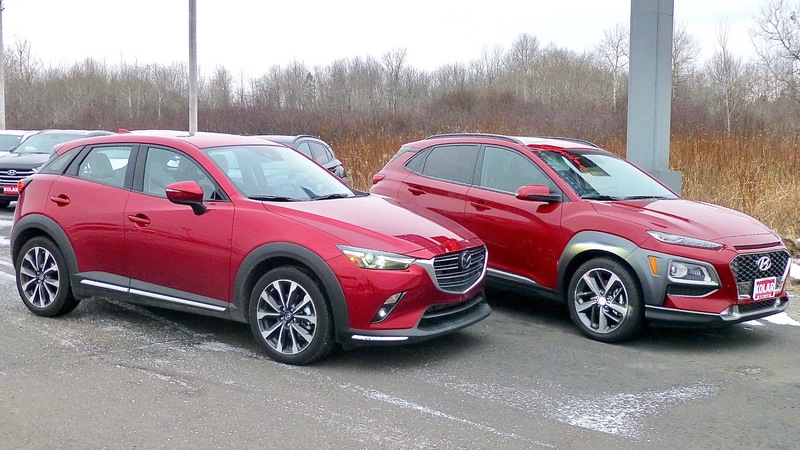 Buying a new vehicle for someone isn’t always possible, but if you need a new vehicle right about now, the CX-3 and the Kona are both available for right around $25,000, which is a modest price, especially when you examine the technology. There are, of course, other wonderful Christmas gift ideas for a lot less than $25,000. One is a set of winter or all-season tires, and the idea of the newest Nokian tires was appealing enough that I drove up to Ninth Street and Seventh Avenue East on the Duluth Hillside to talk to Jeff Hofstedt, propriator of “Foreign Affairs,” a cleverly named service outlet for all cars foreign or domestic, and also the nation’s leading seller of Nokian tires. There are three or four different models of Nokians these days. I remain loyal to the all-season tires, stopping short of the all-out winter tire, the Hakkapeliitta. Without question, the Hakkapeliittas are the best winter tire on the market, matching the legendary Bridgestone Blizzak in glare-ice tracton, and outlasting even that stalwart for long wear in all conditions. I’ve found the WRG, and its newest derivative, the WRG-3, to be outstanding year-round, and still with exceptional snow and ice traction characteristics to get you through the harshest winter. 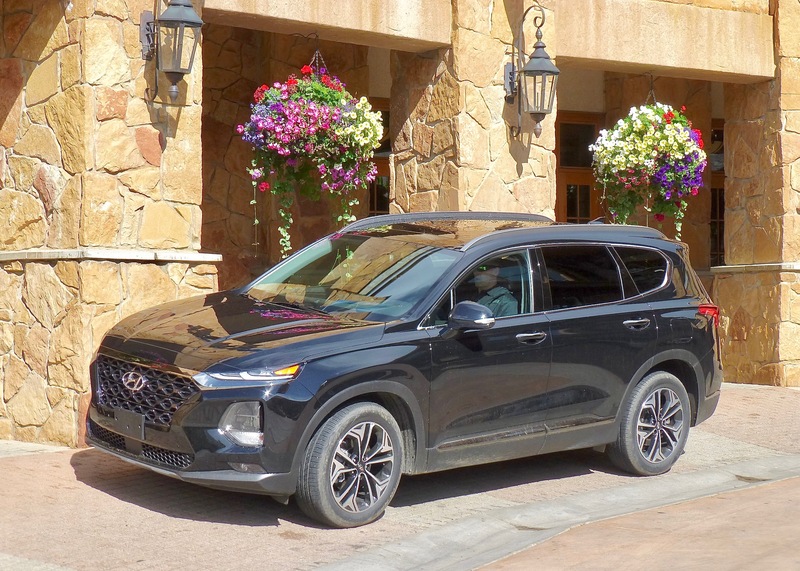 The 2019 Hyundai Santa Fe, all new from the ground up, at the Stein Eriksen Resort in Park City, Utah. 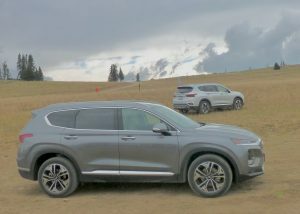 Hyundai displayed its latest concepts of all-wheel drive, all-new suspension fore and aft, variable driving modes, and computer-perfected lane-keeping assistance — all at the same time — which I discovered quite unintentionally while pushing a 2019 Santa Fe around some tight curves at nearly 10,000 feet of altitude. 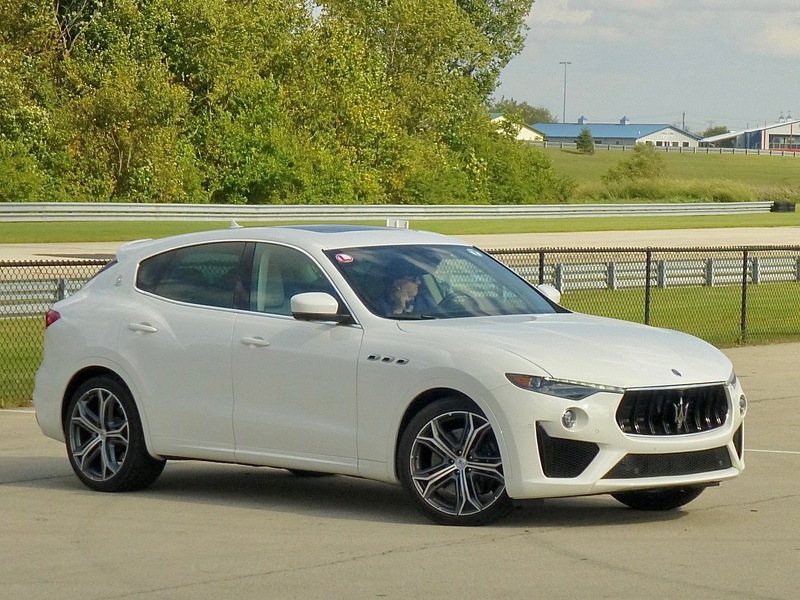 I say unintentional, because I’ve driven many vehicles with all-wheel drive, many with adjustable driving modes, and nearly everything nowadays with some form of lane-guidance or assist, and they have been mostly impressive. 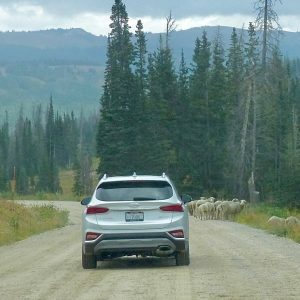 But firmly encapsulated in the driver’s seat of a 2019 Hyundai Santa Fe that I was pushing toward its limits on a high mountain 2-lane in Utah was not where I expected to find all those features operating in concert. 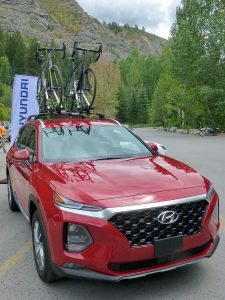 When the Santa Fe came out as the most prominent member of Hyundai’s array of SUVs in 2000, it was the South Korean company’s first serious attempt at participating in the newly expanding interest in building a crossover utility vehicle to haul more stuff than just a family of four. Nobody, including Hyundai, could have foreseen the incredible popularity of SUVs, although the company kept pace very well. It just introduced an impressive small SUV called the Kona, to join the about-to-be-reintroduced compact Tucson, and the larger pair of the Santa Fe and the smaller Santa Fe Sport. High-altitude road tests led Santa Fe drivers to meet for driver changes. Because it is time to adjust the group, for 2019, the Santa Fe is again motoring ahead into prominence. Technically, the new Santa Fe replaces the current Santa Fe Sport as a compact, with two rows of seats capable of housing five, while the larger sibling remains midsize as the unchanged Santa Fe XL, with three rows of seats. 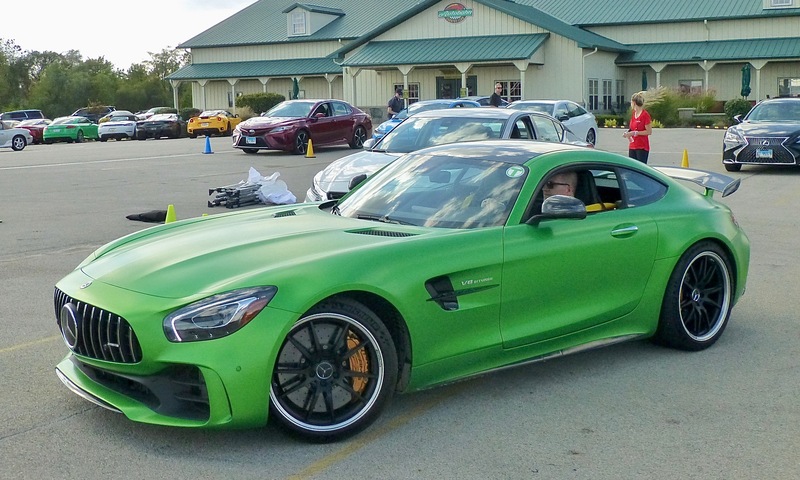 There are enough high-tech features to keep the assembled auto media engaged, but during the pre-drive seminar at the Stein Eriksen Lodge we also learned about the less obvious upgrades that are most important. 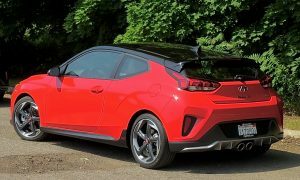 The re-engineered Santa Fe is increased in torsional stiffness from 27.2 to 31.5 in resistance to twisting with a body structure altered from 58 percent to 67 percent high-grade steel. Advanced aerospace adhesives do their part to help lower Santa Fe’s weight by 52 pounds, stronger but lighter. New suspension front and rear feature restructured angles and revised configuration. 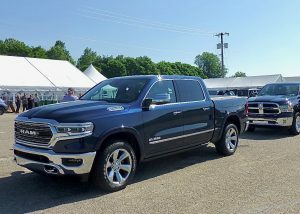 The new H-Trac all-wheel drive system is located between the axles with electric servo operation of a torque-vectoring system to coordinate the front and rear axles in their perfect swath around curves. 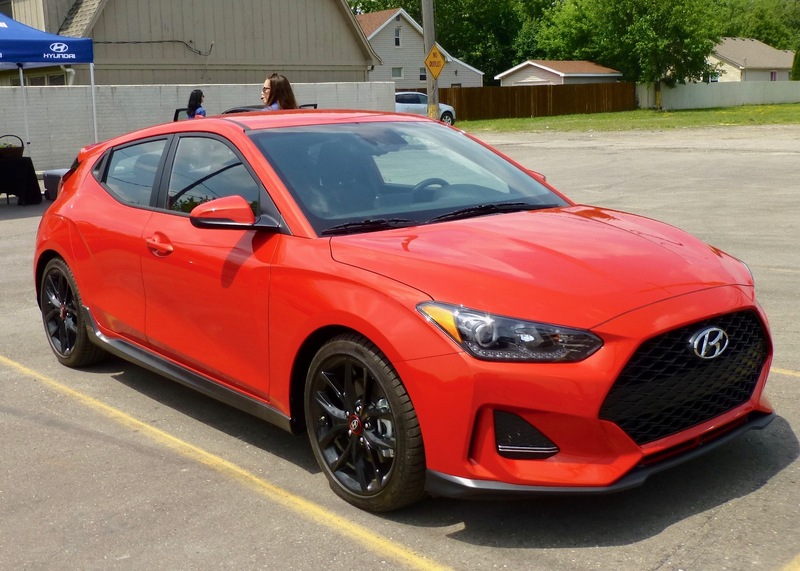 Greatly reduced friction in the new Hyundai-designed 8-speed automatic makes it work more efficiently, with ratios reaching below first and above sixth compared to the current Hyundai-built 6-speed transmission. Switching the modes from “normal” to “smart” and then into “sport” provides noticeable alteration in steering, suspension, and shift-points to an immediately sportier feeling of control. But that’s just part of the picture. 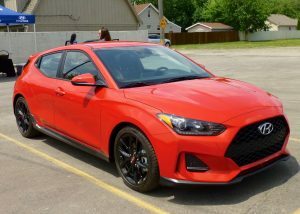 With H-Trac as a base, the stiffer body with firmer steering mechanism and torque-vectoring makes the system react so promptly it feels as though it is anticipating the need to turn before you turn the wheel — more predictive than reactive, Hyundai says. Simply put, having quicker-steering response while the suspension holds the vehicle flat makes for a more comfortably stable ride. We paused in our test Santa Fe to observe a fly fisherman on a mountain stream. Meanwhile, the lane-departure settings are aimed for safety, with four different settings. The first is pretty mild and warns you when you touch the lane markings on either side, Two other settings help assist you in staying off or easing away from the side line, and when you get to the fourth level — that’s the prize. 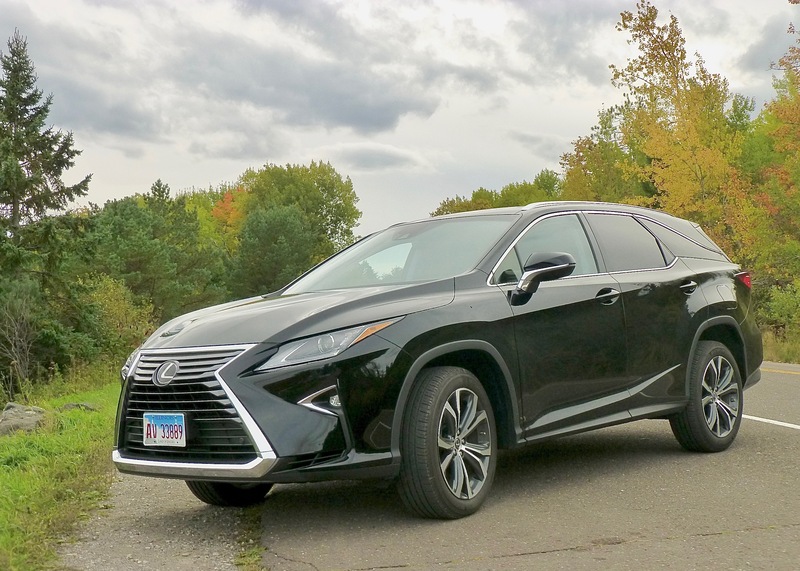 It actually uses four ultrasonic sensors, two high-frequency sensors and four other cameras monitoring the vehicle to gently but surely keep you equidistant from the inside and outside lane boundaries. It wants you to be centered in the lane, and it offers definite assist to see that you do. We hadn’t played much with all of that until we had climbed high up into the spectacular scenery of the mountains, past the occasional road-side deer, and the frequent herds of sheep, with and without sheep-herders on horseback. When we did engage the most aggressive lane-centering system with the upgraded and coordinated handling modes set to sport, the Santa Fe changed personalities completely. 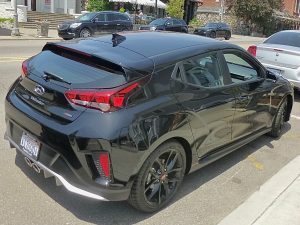 I could drive quite hard around serious curves, and while it reacts instantly to your steering touch and stays flat, it also keeps you centered in your lane even as you push harder and harder. 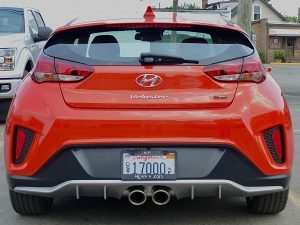 It reminded me of years ago, when we got our son a Hot Wheels slot-car race track where you could hurl the little cars around long, flexible orange tracks which had side edges high enough sides to keep the car on track. My only manipulation is that I wanted to be sure to be driving the all-wheel-drive Santa Fe both morning and afternoon, because in Duluth, Minnesota, choosing an SUV without AWD is not wise. That meant we were in a gorgeous grey Santa Fe Ultimate, the top-of-the-line model with 2.0-liter turbocharged 4-cylinder engine, churning out 235 horsepower and 260 foot-pounds of torque that rise to that peak at a mere 1,450 RPMs. 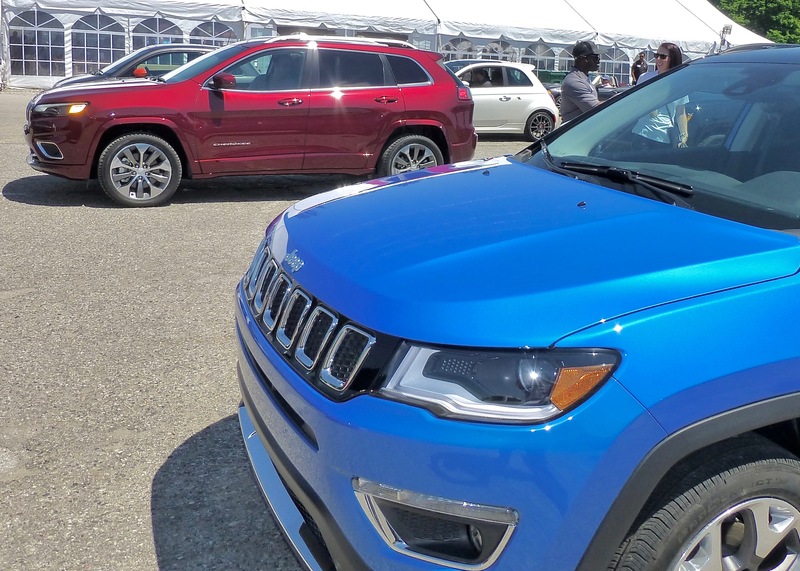 The base engine is the tried and true 2.4-liter. Larger in displacement but without a turbo, it has 185 horsepower and 178 foot-pounds of torque. 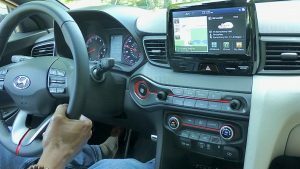 When Miles urged me to push the Santa Fe harder around those curves, I remarked that the sport steering combined with lane-centering controls gave it such amazing precision that it took awhile to gain the proper trust in its handling. Well-sculpted contours make the Santa Fe a stylish way to tour the Utah mountains. We also spent some time on rough gravel roads, and finally got to a rugged hill-climb area where we had the chance to try to make it up a lengthy, steep, uphill gravel road, rutted and rough mostly, and muddy in other parts. Such challenges require the same instincts as trying to make it up an icy avenue in Duluth on a January morning. We left it in drive, shifted the terrain setting to lock in the all-wheel-drive system on 4×4, and hit it. No problem. The face of Hyundai SUVs evolved to what they called a “cascading” grille, with horizontal rows of silver bars that made that concept readily identifiable and attractive, as if a waterfall might cascade from rail to rail. The new Kona was a surprising change, and it led the way to the entire field of Hyundai SUVs adopting the new signature face. 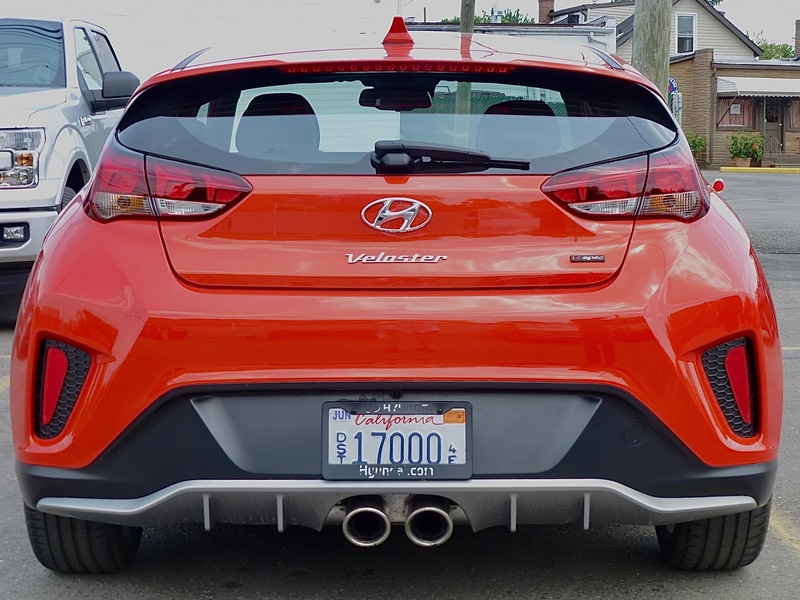 While mostly a pattern of black openings gathered within the familiar outline shape, Hyundai is still identifying it as cascading. 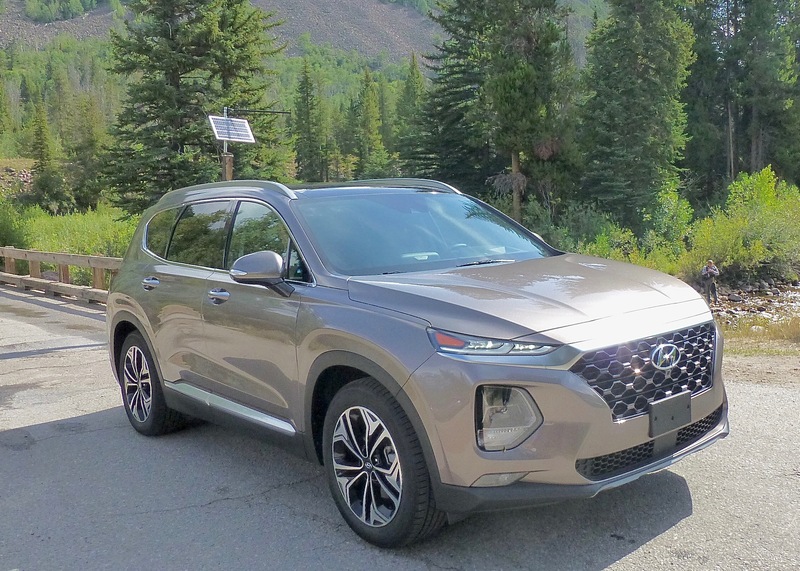 Our introductory test drive of the 2019 Hyundai Santa Fe was held at the luxurious but rustic Stein Eriksen Lodge in the mountains near Park City, Utah, which is just to the east of Salt Lake City. From there we drove skyward, around curvy highways up to an altitude of 9,753 feet. We descended back down similar roadways for a lunch stop at Robert Redford’s Sundance resort, which has made its own name for indie film competitions. Word is that Redford built his mountain enclave in the area where he could also offer its spectacular scenery and terrain for such classics as Jeremiah Johnson. Santa Fe for 2019 shares the new look of Hyundai’s signature “cascade” grille at Robert Redford’s Sundance Lodge. When our drive started, the first thing I noticed along with the precise steering was the near silence of our interior. Insulation in the fenders and padding on various parts of the floor are augmented by thicker laminated glass. 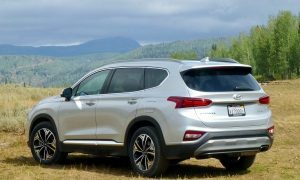 Hyundai officials stressed the safety inherent in every Santa Fe, from the least-expensive $25,300 SE, to the $27,680 SEL, to the $29,800 SEL Plus with leather, to the $32,600 Limited, and to the $35,450 Ultimate. 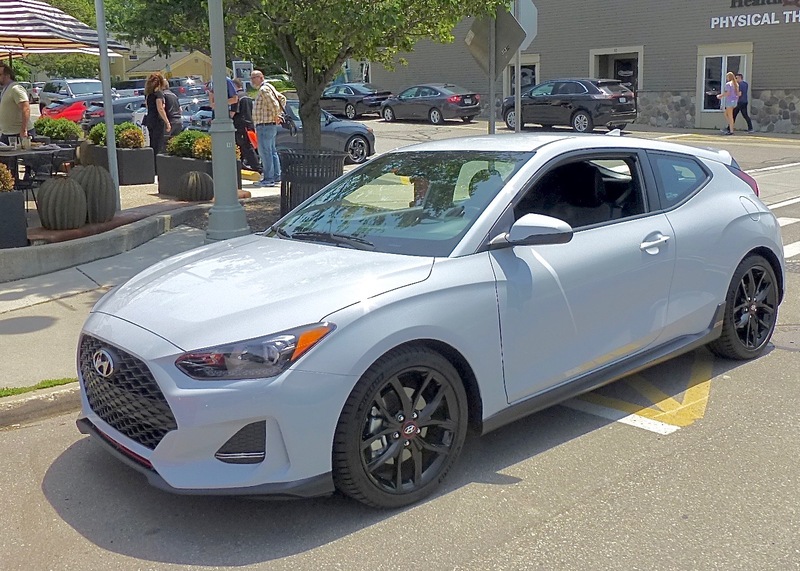 Standard features are forward collision avoidance assist; blind-spot avoidance assist; lane-keeping assist; cross-traffic avoidance; safe exit assistance; high-beam assist; smart cruise with stop-and-go at traffic lights; and driver attention warning. As you move up in models, avoiding the multiple-choice plan of adding options piecemeal, you get refinements that set the Santa Fe apart. 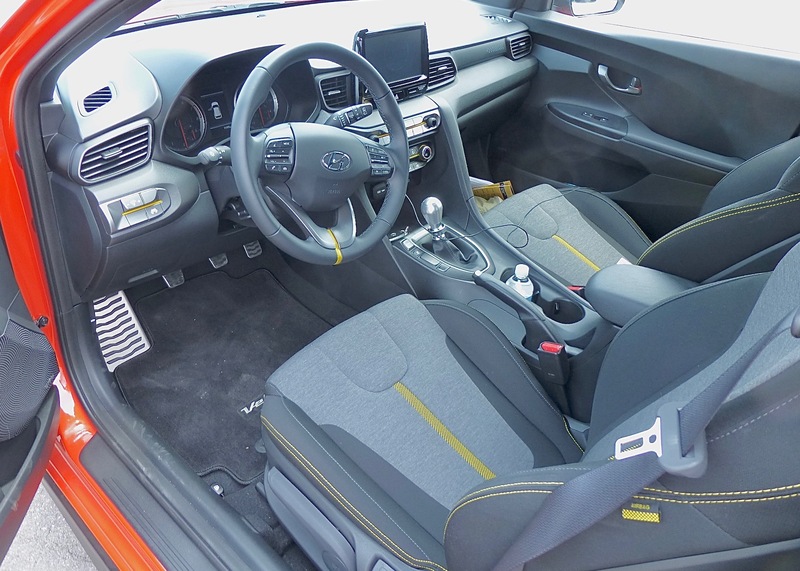 For example, along with back-up warning, you get a rear exit assist, which prevents a rear-seat occupant from opening the rear door if the Santa Fe notes that a car is approaching on that side to pass. Same if a child or pet is in the rear seat and the driver locks the vehicle and runs inside a store. Any movement by the child or pet will caust an alert to sound on your smartphone, and the horn honks. 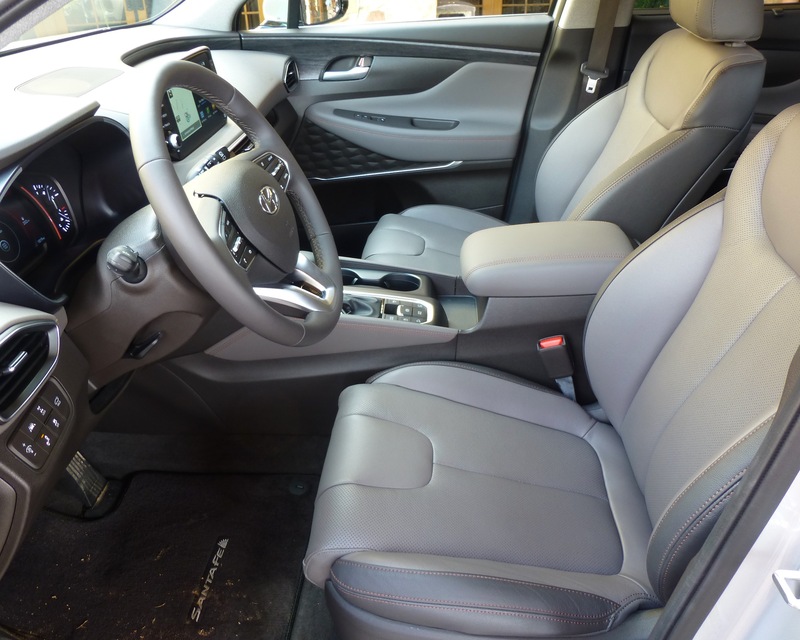 The Santa Fe Ultimate is loaded with luxurious soft-touch fabrics and leather seats. If that’s all futuristic over an above the now-familiar heads-up display, wireless charger, heated and ventilated front seats, surround view when parking, rain-sensing wipers, panoramic sun roof, rear sunshades, music restoration on the Infinity sound system with music restoration, that’s what you have available on the new Santa Fe. We car-testing journalists love to act like we’re better drivers than the norm, and in many cases we might be. But in our arrogance we can insist we don’t want any car assisting us. I said with the Santa Fe, that was a mistake for two reasons. First, you don’t get to evaluate a valuable safety feature. And maybe, I said, “you just didn’t want the car pointing out how often you veer across the white lines. Venturing off Utah highways led to a confrontation with the odd herd of sheep. 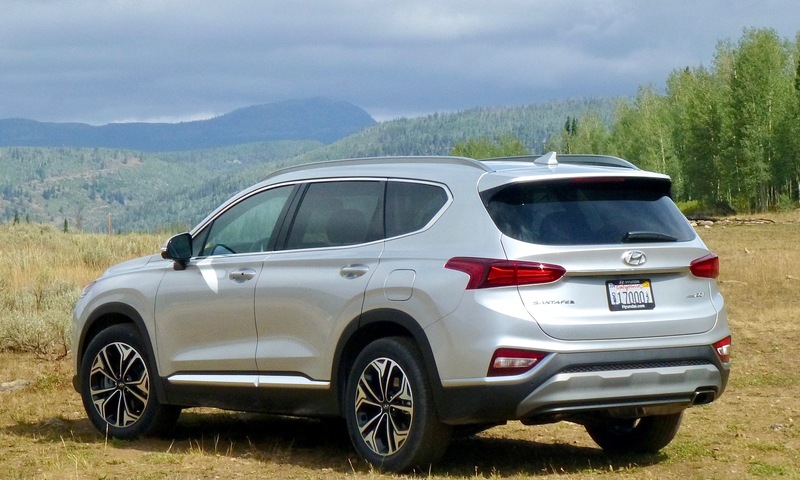 Clad in all-new sheet metal on the outside and with a completely redesigned interior with all soft facings, plus a much more rigid platform and all the driving-assist stuff, the new Santa Fe is the perfect example of how a high-tech company can build a safe, solid, cutting-edge vehicle. 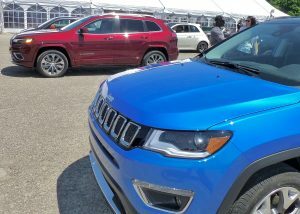 It may be the perfect compromise of a smooth and comfortable family hauler that is ready, willing and able to go off-roading with Jeep-like performance, head for the shopping mall, and, when pushed, handle like a slot-car.